Point Cloates Lighthouse | Lighthouses of Australia Inc. The abandoned tower of the Point Cloates Lighthouse stands starkly on a sandhill ridge near Ningaloo in north Western Australia. Built in 1910, the light is one of five built with Commonwealth funding before the anticipated Commonwealth take over in 1915. The light was particularly remote and the living conditions were cramped with the two lighthouse keepers living in one cottage with their families. The keepers had to be self reliant, growing a garden of vegetables, and hunting goat and fish. They traded supplies with the local Aboriginals in exchange for tobacco. The remoteness was relieved with regular socialising between the families of the nearby Ningaloo Pastoral Station. Education was by correspondence, with the children later boarding with relatives in the bigger towns so they could attend school. An interesting insight into past attitudes was in 1916, when one of the lightkeepers was cautioned by the Commissioner of Police and, the State Premier of the day, for having a relationship with an Aboriginal woman in contravention of the laws of the day. The light was automated and demanned in 1933. The lighthouse was severely damaged in the mid-1930s and abandoned, and sold to the owners of the 49,000 hectare Ningaloo sheep station in which the tower is located for î ‰t is likely the damage occurred due to the tower’s poor foundations, but could have been due to an earthquake. A replacement light, a 22m steel lattice tower, was built on nearby Fraser Island, a sandy islet just offshore from Point Cloates, in 1936. However, in 1966, a storm blew away the islet and the tower collapsed. A replacement GRP cabinet was built about 1 kilometre south of the original sandstone tower, and its name reverted back to Point Cloates. 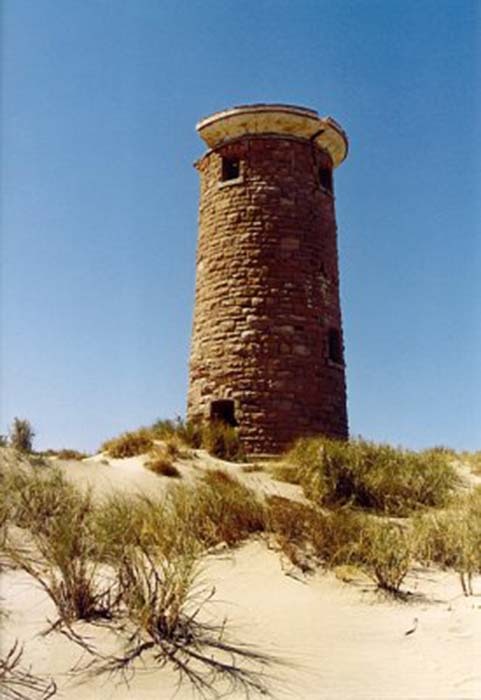 The original lighthouse tower is extremely remote and is best accessed by 4 wheel drive from Carnarvon or Exmouth. There are no formal tours. The tower is on private property but can be visited if permission is obtained from the owners.